UN - 15 January 2015 – The Israeli-Palestinian conflict is now entering uncharted territory as tensions between the two sides escalate and an “ever-widening trust deficit” risks hampering future peace talks, a senior United Nations political official told the Security Council today as he urged Palestinians and Israelis to “plot a course” and work towards a negotiated resolution. Briefing the Council on the situation in the Middle East, Jens Anders Toyberg-Frandzen, Assistant Secretary-General ad interim for UN Political Affairs, warned that neither the Palestinians nor the Israelis had taken the “challenging steps or made the bold decisions” required to rebuild trust, further reducing the likelihood of a resumption of talks. In recent weeks, both sides have experienced a worsening of relations amid a series of unilateral moves which have only served to deepen tensions. On 30 December, a draft resolution was submitted to the Security Council aimed at reaching a final status agreement and an end to the occupation of the Palestinian Territories. When the resolution failed to pass, the Palestinian delegation signed instruments of accession to 18 international treaties, including the Rome Statute of the International Criminal Court. The following day, Israeli authorities froze some $127 million in tax revenues collected on behalf of the Palestinian authority for the month of December in violation of their Oslo Accord obligations. “The Secretary-General is alarmed that the parties are now engaged in a downward spiral of actions and counter-actions and calls on both sides to refrain from any actions that would exacerbate existing divisions,” Mr. Toyberg-Frandzen declared, as he called on the international community to “uphold its responsibility” in shepherding a way forward on a two-State solution. Pointing to the situation in the Gaza Strip, where Palestinians and Israelis recently fought a 50-day conflict resulting in the deaths of more than 2,100 Palestinians and more than 70 Israelis, Mr. Toyberg-Frandzen warned that the security situation was once again showing signs of “serious deterioration.” Most recently, he added, a 24 December exchange of fire across the border resulted in one Hamas militant killed, and the injuries of three Palestinian civilians and one Israel Defense Force personnel. “The Strip is balancing on a tightrope that will continue to fray unless a number of critical issues, many of which are political, are tackled with both determination and a heightened sense of urgency,” he explained. 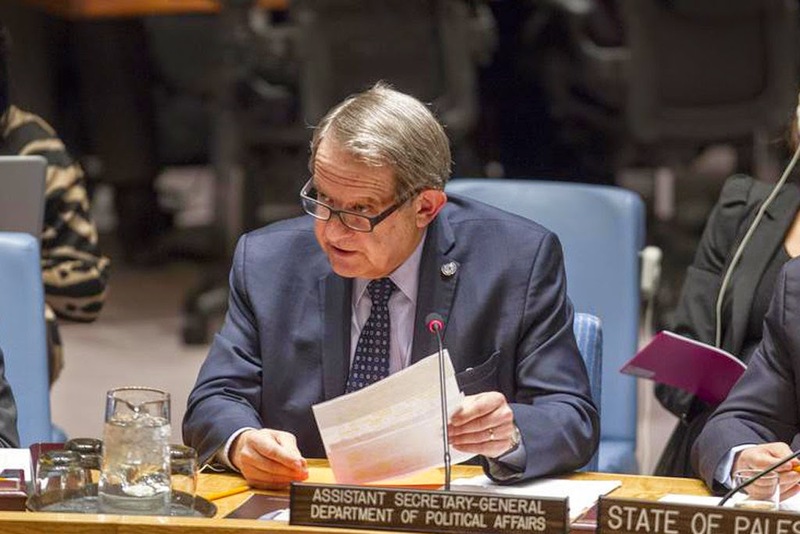 In particular, he noted, the payment of salaries to Gaza employees remained outstanding and reconstruction in the war-devastated Strip – assisted by the UN-backed Gaza Reconstruction Mechanism –was not being implemented at the required scale. According to UN estimates, in fact, up to 100,000 families continue to live in houses that have sustained varying degrees of damage while 18 UN-supported school buildings continue to serve as collective centres for some 15,500 internally displaced persons. “Obtaining the necessary financial resources to allow Palestinians in Gaza to procure [construction] materials continues to be a monumental challenge for the majority of those in need. Most pressingly, donors have largely failed to fulfil their pledges,” the UN official said. With Gaza immersed in a “stark reality” of challenges, Mr. Toyberg-Frandzen also warned that violence continued to affect the West Bank, including East Jerusalem, with some of the worst hostilities between the two sides seen in over five years exacerbated, in part, by the continued construction of Israeli settlements on Palestinian land. Nonetheless, he voiced encouragement at the recent Israeli Supreme Court decision of 25 December ordering the evacuation and demolition of the largest settlement outpost in the West Bank within two years. Against that backdrop, said Mr. Toyberg-Frandzen, the climate in other hotspots around the region remained equally fragile. In Syria, where the country’s brutal civil conflict is heading into its fifth year, UN-backed consultations aimed at freezing the fighting in Aleppo are continuing while, in Lebanon, talks between national stakeholders are making headway in an effort to ease the country’s sectarian tensions and spur the election of a new President.